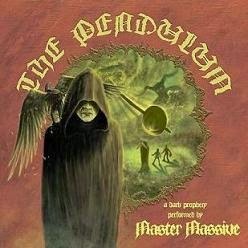 RockUnitedReviews: MASTER MASSIVE: "The Pendulum"
The underground mythical Swedish Heavy Metal project of Master Massive, led by the flashy guitarist Jan Strandh (Zanity), is finally set for a proper release after spending the past 23 years as the obscure cult act with several demos on their hands. Based in Skövde, the concept album and Metal opera of The Pendulum feature a long list of singers from their hometown, including: Peo Pettersson (Axia, Leviticus, solo), Katarina Lilja (Therion), Tony Niva (Niva, Lion's Share, Zanity), Tony Yoanson (Masquerade), Petter Karlsson (Therion), Öivin Tronstad (Jupiter Society), and original vocalist Erik Forsberg. It's old school metal that you either could file under (very early) Yngwie Malmsteen (think: 'Marching Out') meets Mercyful Fate, or why not the more melodic version of Candlemass and Manowar with just the hint of Maiden? It's nonetheless pretty impressive stuff and it's one of those albums that gets better with each spin (up to a certain point of course, it's not like it would go on forever and ever). And like a proper libretto, the lead singers are playing different parts and characters in this fantasy world of ancient Gods. It's basically the old story of good vs. evil. According to Strandh: "In this opera – The Pendulum, one single individual is given the power to change the fate of the Earth. Impossible in real life, but totally viable within the aesthetic framework of opera as an art form. In our opera the human being chosen for the assignment is a normal person, not a hero character. His only weapon in the fight for the Earth’s survival is his ability to refrain from the thoughts, feelings and habits hitherto a natural part of him." Ehh. Yes. It's all a bit over the top. Don't confuse the words 'metal opera' with typical high pitch screaming folks though. Sure enough. Peo, Niva, Lilja, etc. are all working in their upper range, but never as extreme as say King Diamond. The Pendulum provides 70 minutes of epic heavy metal of excellent caliber, firmly rooted in the eighties groove. In fact. The track, "Time Out Of Mind", dates back to the eighties as it's the old Zanity song with reworked lyric to fit the concept. It's difficult to pick any special tracks and highlights since they're all part of the story. I'd have to say that it's all good stuff even if something like 'Sovereign Power' with its DIO meets Mercyful Fate sound might just attract hordes of headbangers. I enjoy the fact that you can actually pick up the sound of the bass player (Karl Nyhlin, also lute, theorbo, mellotron) as he lay down some wicked lines in the old school of Harris, DeMaio, and indeed Andersson (Leviticus). Add to this excellent guitar work by Strandh, Yngve Frank (Zanity, Mean Streak), and top notch vocals by the cast and you're in for a metal treat. You need to spend some time with this album though. Ambitious work with a complex structure and progressive undertones. Recommended if you're into above mentioned acts and styles. RAGING DEAD: "Born In Rage"
The LEISURE SOCIETY: "The Fine Art Of Hanging On"
EMMY SOPHIE: "Inte Som Förut"